Posted on Dark Faerie Tales.In the third and final installment of the Other trilogy, Karen Kincy brings us Foxfire. I read Foxfire as a standalone, not having read the others. I was worried that I would lose the integrity of the story and miss many things that I would have found relevant if I read the whole series. Gladly that isn't the case. Kincy did a great job allowing the reader to feel involved in her world from the beginning. I enjoyed the story and the characters, convincing me to go backIn Foxfire, Gwen and Tavian travel to Japan to visit his adopted grandparents for the holidays. Tavian, a kitsune, or a shape shifter who takes a fox form, was born in Japan. His birth mother was also a kitsune, but disappeared when Tavian was only six years old. But as Tavian landed in Japan, he began to see a faceless ghost. He begins to wonder who haunts him, only to be contacted by his estranged mother. Tavian uncovers so many truths about his past, putting him in harm's way.Tavian was a voice that was easy to get to know and understand. The first chapter was a flashback to when his mother disappeared. It was heart-breaking, and allowed me to instantly connect with him. There were times when I disliked him and his personality. He always seemed so strong, and here he is so vulnerable and filled with doubt.The kitsune folklore is one that I knew growing up. Japanese folklore is filled through the pages of Foxfire, blending old history with common day interpretations. Kincy brought an interesting take, one that I enjoyed. From the customs and traditions, it was enjoyable to see how Tavian blended into Japan in present day. It's not always easy to bring folklore into the present day, but I think Kincy did a good job. Kincy brought a Japan that is filled with wonder, magic, and danger. From the evil doings of the Yakuza, to the deadly traits of the assassins, Foxfire is filled with a lot of action.Kincy has this quality about her that allows the reader to get lost in the story. You're quickly immersed into her world, absorbing the different details that she brings forth. I liked the familial dynamic that she portrayed in the story. It brings another layer of this particular plot. Man vs the supernatural is always one of my favorite, and she blends it well with various subplots.Foxfire is filled with mystery and secrets, culture and history - all elements that make a great story. 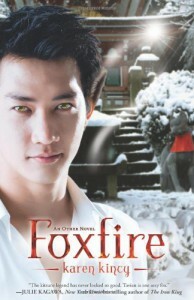 Foxfire is a good read, something that I recommend to urban fantasy fans.